I use a variety of bookmarklets that make life easier. These days, I’m using Chrome because I heard that Safari has some security vulnerabilities. So, I’ve re-installed all my bookmarklets and realized they were hard to find. Press This is a bookmarklet: a little app that runs in your browser and lets you grab bits of the web. I don’t use this a lot because I tend to post things in Google + if I want them to go to twitter. I have a IFTT setup for syncrhonizing G+, Twitter, and Facebook to publish in that direction. I use this one for a few of my Google Blogger blogs. This is for my “Data Pro” tumble blog. It’s now available at <https://www.tumblr.com/apps&gt;. I also use the Pinterest extension on Chrome for saving interesting images. When I worked for the NBII we used Rackspace and Amazon’s cloud service, along with MySQL for the “Species of Greatest Conservation Need” database that held a similar number of species, but no spatial data. Since your data has a spatial component, something like PostgreSQL or SQLite might be worthwhile to look at. I took a class in environmental information management last summer and was introduced to SQLite – which apparently has some advantages over databases created with Access, including native support for GIS applications like GRASS and QGIS. Finally Tom Colson mentioned something he’s working on with GSMIT – the Otter Spotter. Tom said Google Earth Engine might be worthwhile looking at for that. Google offers grants and hosting of data for non-profits to use Earth Engine, so I’m curious how much of the ATBI database data might be translatable to KML. When I worked for the NBII I was interested in serving up spatial data in KML files – I like them because you can open KML in robust GIS packages along with popular virtual globe tools like Google Earth or ArcGIS Explorer – things the everyday person has access to. Even if not all the data can translate, it’s another “view” of the ATBI data that’s pretty useful for outreach, if not doing actual science. I will explore at this issue as I have time and hopefully help as I am able. I am a student of RDBMS and the ATBI is one of the more interesting datasets to learn with. Except for two, the Pratt Students again split off from the UT Science Data scholars today for an afternoon visit to the world headquarters of Thomson Reuters. Again, it was a very hot day, and we were lucky to avoid direct sunlight in their most Bond villain-esque office space. We also joked about the “Ally McBeal” unisex bathroom – which had fully enclosed stalls that might have once been massage parlors, given the mood lighting, and rectangular faucets that “spilled” water rather than “poured” it. A fun architectural space, but probably not compliant with the Americans with Disabilities Act. For that matter, I’m confident most of London isn’t compliant with the Americans with Disabilities Act. I burned through the last pages of notes in my notebook at Thomson Reuters. I was writing in the margins. TR might be best known for the Reuters news service. They also deal in financial risk, legal, tax and accounting, and Intellectual property and science. One of their big products is the “Impact Factor.” Starting with founder Eugene Garfield in 1955 in his paper in Science, “Citation indexes for science.” This is highly pertinent to my research into networks because they use a “researcher ID.” This can avoid some problems I’ve encountered in cataloging where the author is published under various names that are all the same author. E.g., “J.T Scienceguy” versus “Jeffry T. Scienceguy” or “Jeffry Tomas Scienceguy.” A database sees those as different entities, even though it is indeed the same person. With a researcher ID, your database does not get complicated, and you can do a lot of data science. There is some research analytics, and also they “peek” into repositories – I need some follow up information on how they prioritize repositories based on “who manages, how’s it updated, how frequently, and what’s the quality.” They have a white paper on that but I have yet to find it. It could be useful for my research with DataONE and developing/prioritizing member nodes. The map of science I need to follow up with Patricia Brannen. Finally they have some research out of Philadelphia, U.S.A. regarding networks, influence of research over time for individuals. They are not yet that honed in on how to do it for an ad-hoc group of researchers. Disappointing, as that is what I’m hoping to do with research into collaborations resulting from DataONE interactions. London Experience, Day 2: Cultural Impact on E-Publishing? Since settling in and prior to arrival, a key question on my mind is this: why is London, England such a center of publishing activity for scholarly journals? Why might it be more advanced than in the United States? Are there cultural differences, or has Europe simply been at the forefront of publishing for the longest? Certainly there is a long tradition of academic scholarship in Europe – and Europe is the birthplace of publishing in the modern sense, of mass production and dissemination of printed material. There are certainly an abundance of scholarly institutions – libraries, museums, universities – in and around London. Great scholars from Newton to Darwin hail from England – Darwin is even on the 5 pound bank note here, and is buried in Westminster Abbey. Egyptology, “natural philsophy” and medical arts were all in vogue in Europe – particularly London. The Dutch Scientist Anton Von Leeuwenhauk in 1683 published a series of letters and pamphlets on his observations of small “animacules” via primitive lenses, precursor’s to today’s microscopes. Who received his correspondence? The Royal Society. Not of Denmark. That’d be the Royal Society of London. So why was a Dutch scientist corresponding with the Royal Society? Was it the only venue for scientific communication in Europe? Perhaps. Founded in 1660, it was certainly the oldest, and in 1665 began publishing “Philosophical Transactions,” arguably the first scientific journal in the world. So London clearly had an early start in the scientific publishing game. Two protestant states, Germany and England, seem to have a key role in the science communication story. Perhaps because anywhere else, scientists risked excommunication? Or, was English as the language of commerce the central focus of early science communication efforts? This might be the first sign of the cultural impact upon scholarly publication in Europe. I also have considered the attitude of the people of England themselves. Citizens of the U.K., especially following the Victorian age of empire and epic struggle against fascism and totalitarian rule in the latter half of the 20th century, are perhaps among the most ardent supporters of a free and open democracy. England indeed was among the first countries to reject foreign rule by the Vatican, and first to set the course for modern representative democracy with the Magna Carta. What might this cultural love affair with open access and democratic control and self determination mean for scholarly publishing? In spite of being the center of commerce and a world financial center, clearly embracing the capitalist model, might the cultural love of community spirit lead to a greater emphasis on open access? These are interesting questions to consider in contemplating access to scholarly materials as a product of England. Not so in the U.K. Complete strangers shared not only personal space but physical contact – completely without hesitation. No accident, I sat elbow-to-elbow on the tube, with no effort made to keep at least an airspace. I wondered if this was something inherrent to a large city – I’ve visited New York and Washington underground transit systems and don’t remember such familiarity – or if it’s just part of British culture. They fought tooth and nail through a war – many families cramming into the underground system. Propoganda posters like “All together now” may have galvanized society to see itself as one cohesive unit – casting aside the “cowboy” or “desperado” mythos of the U.S.
Further prompting my thinking along these lines was a message in both the common kitchen and bathroom – concerning “fairness” of cleaning up. While in the U.S. such snarky, slightly passive aggressive notes are more concerned with “we are not your mother or father” and encouraging personal responsibility, the bathroom/kitchen messages in my University College dorm (Astor College on Charlotte Street) extolled the virtues of being “fair.” It is “not appropriate or fair to others” to leave dirty dishes in the sink; “it is not fair to the cleaning staff or others” to leave a mess in the bathroom. The U.K. does seem concerned with fairness as evidence by public transit, universal healthcare, and this anecdotal evidence provided by my signs. Might this cultural reverence for “fairness” also permeate into the publishing realm, specifically regarding open access to scholarly and scientific information? Finally, London was the birthplace of the term “scientist.” There was some discussion today in class regarding the start of the first true “scientific journals.” An interesting way of looking at it could be via the Google nGram project. Already described by a variety of bloggers, the popularity of the word “scientist” can be traced against that of “natural philospher” based on both words’ appearances in digitized literature. A chart of the two from 1800 to 1900 shows “scientist” is the clear victor. From Cambridge University, William Whewell coined the term “scientist” around 1830 as a play on “artist.” It was not until the later half of the 19th century that the term flourished in the popular literature – from the Google nGram for the word, we can see that it passes “natural philosopher” only in the 1870s. The scitext website from Cambridge puts the earliest French semi-scientific publication, Journal des Sçavans at 1665, the same year that “Philosophical Transactions of the Royal Society of London” started up. Finally I see something of an arc from the “natural philosopher” – the tinkerer, ponderer, renaissance man – to the true specialist – and finally to the “generalist,” as one blogger suggests prominent, interdisciplinary scholars like Jared Diamond can be described. Even Charles Darwin himself was a generalist – with wide ranging interests. Yet to stay current, scientists seem to increasingly be forced into specialization. Perhaps a rise in collaboration is the only way to retain the “natural philosopher,” holistic perspective. My summer semester of 2013 includes a 3-credit hour course in Scholarly E-Publishing. This course provides exposure to an international electronic publishing industry, particularly focused on journal and book publishing, from a world center of electronic scholarly publishing: London, United Kingdom. It offers an intensive series of talks, site visits, and instruction designed to explore how e-publishing is changing both the way scholarly research is conducted and communicated. Information professionals from Oxford, Cambridge, the British Library, Elsevier, Wiley, Proquest and more share their unique perspective on scholarly publishing. Because scientific effort must be clearly communicated and disseminated via scholarly publishing, the course content is of particular interest to the University of Tennessee “SciData” program and is highly relevant to my professional and scholarly goals. I am particularly interested in understanding how publishers intend to work with open access data repositories such as DataONE, Dryad, or spatial data repositories such as ShareGeo in the UK or EDAC in the U.S. I am interested in the concept of the data paper, and how a dataset and a data paper might be linked to a publication and shared across platforms with the scholarly community. The course is a joint venture of University College London Department of Information Studies, the Pratt Institute School of Information and Library Studies in New York City, and the School of Information Sciences at the University of Tennessee. Given my background in natural sciences (B.S., Ecology and Evolutionary Biology) and entry into the UT School of Information Sciences 2013 cohort concurrently with the 8 SciData Scholars, I was allowed the opportunity to participate in the course. Along with a blog of reflections on daily course material and the London experience, the course culminates in an individualized research paper. I intend to focus on the role of data and datasets in scholarly publishing. The role of datasets in scholarly publishing is most pertinent to my work with the DataONE project concerned with accessibility and preservation of environmental data. For more on the course, follow the tags “INSC 590 – E-Publishing” or view the syllabus online (SU13-IS590-E-publishing, PDF). The Course Syllabus is also available as a .doc format <http://scidata.sis.utk.edu/sites/all/files/590%20SyllabusTenopir2013.doc>. I arrived in London on Monday to overcast skies and blustery temperatures – blustery at least for a Tennesseean, especially one who’d just spent 3 weeks in New Mexico’s high desert at the University of New Mexico Environmental Information Management Institute. I’d been chasing the sunrise eastward since 10:25sunday morning, leaving the arid desert for a 2 hour hop to George Bush International Airport in humid Dallas, Texas, then taking a direct 9 hour International flight to Heathrow International in London. Cloud bank on the approach to London. The sun rose high over the northern latitudes above a sea of clouds – I pondered how generations of Europeans had made the reverse trip across the frigid North Atlantic towards a better life in the Americas – and how some never made it to that promised land. It is odd to be an American making the reverse journey, especially so non-chalantly as on a jet aircraft. Perhaps the former fleet of Air France supersonic jets gave an even more injurious insult to the hard-won sea voyages of early seafarers. As the plane made a descent to London, I caught a few glimpses of the rocky coastline – which only a few weeks before I’d been discussing the fractal nature of the British coast. It was nice to see in person. 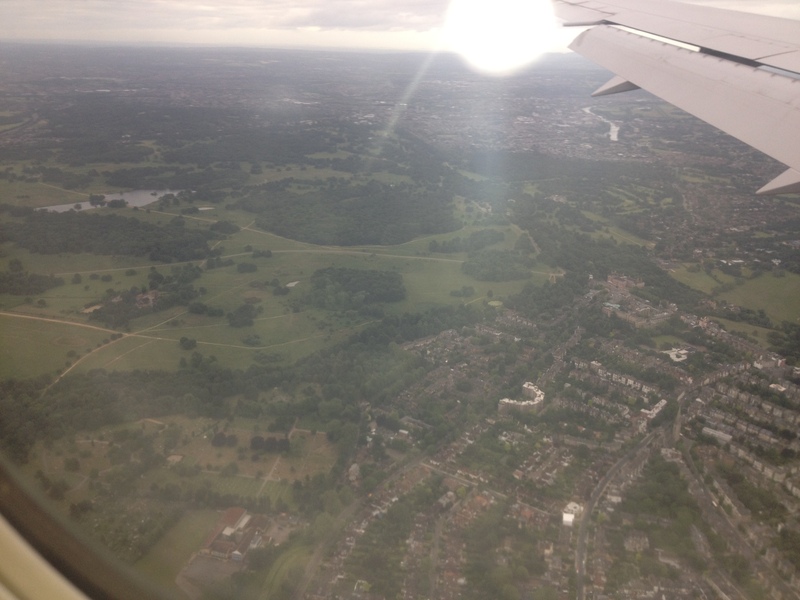 Nearing London, I took interest in the orderly structure of the city’s layout, especially in comparison to U.S. cities like Atlanta and Charlotte I’ve flown into – metropolitan areas with much surrounding land where sprawl freely creeps. The countryside was lush and verdant. Rolling hills in the distance surprised me for their semblance to the rolling green hills outside Knoxville, Tennessee. The city grid seemed efficient and bustling – my eye focused on the steadily snaking rail lines and linear beads of mercury running along iron oxidized tracks, carrying morning commuters to their destinations. Note the open space and clearly defined edges. Culturally, is England less prone to Sprawl? This is the land of the “commons” after all. In as much as communication and information is a transportation problem, essentially how to transfer information from one location to another, the idea of my transatlantic flight and these inner city commuters captured my imagination. As much as my flight makes earlier transatlantic flight seem hopelessly primitive, I wonder how many years will pass before out fossil-fuel based jet setting is also hopelessly primitive, perhaps as our atoms are bounced across continents, transmitted and re-assembled as a data stream a la Star Trek transporter fame. As I embark to study scholarly e-publishing, the same question arises: what technology has yet to exist that will revolutionize publishing as much as the printing press did in 1450? Certainly the Internet has significantly enhanced publication and dissemination options, but it is still largely based on an electronic version of the print medium paradigm. Even with tablets, many newspapers simply offer a PDF version of their daily magazine – embracing the full potential of digital publishing may require not only technical expertise but also a strong imagination to envision and embrace the possibilities presented by fully digital scholarly content. I’m looking forward to exploring this topic in the next two weeks.